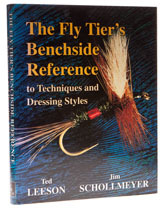 Every now and then a book comes out which really has the power to impress, Casting Illusions, and Rare and Unusual Fly Tying Materials being two good examples, but Leeson and Schollmeyer's book is in a league of its own. I won't even begin to describe it, except to say that if you are really serious about tying flies, then you cannot afford not to buy this. Even at eighty quid it is a bargain, because you would have to spend four times that amount on other books to get as much value. Every fly tying technique I can think of, and hundreds that I can't, are listed and pictured here and if you own this, you really won't have a good reason for buying any more fly tying books (but you will). The explanations are clear, the photos are wonderful, and I gather that the first edition is nearly sold out. Beyond outstanding.